The abbreviation, ‘DSLR,’ stands for Digital Single Lens Reflex. Sounds complicated and a little cumbersome, doesn’t it? Have you ever wondered why is it called so? If you have, keep going and I will tell you. However, if all you wanted to know was just the full form…well…you already got that. I have always found abbreviations short and condensed form of things; very mysterious and sort of encrypted as if they were withholding a lot of information within them, which is hidden from plain sight (in my defense I was very young then). And as it turns out, they actually they do. Many abbreviations have become so commonplace in our daily lives that we unknowingly use them all the time without even questioning what they mean. What I found most of the time was, if you write up the full form and then try to figure out the root story behind each and every word you will eventually come across a lot more information that you never knew existed. A very easy and straightforward example is the abbreviation ‘U.S.A’ or The United States Of America’. Have you ever wondered why it is called “United States”?…..nope? Well, you see when you say ‘America’ what you are actually referring to is the entire continent of America and its associated islands. The American continent is divided into North America and South America (which has countries like Brazil, Argentina, Peru, Paraguay, etc). Even in the northern part of the American continent, we have Canada and Mexico bordering the north and south of U.S.A respectively. So, now, we have just the central part of North America which is again subdivided into 50 states which are each separate sovereigns. This means that each one of the 50 states has their own state constitution, state government, state courts. 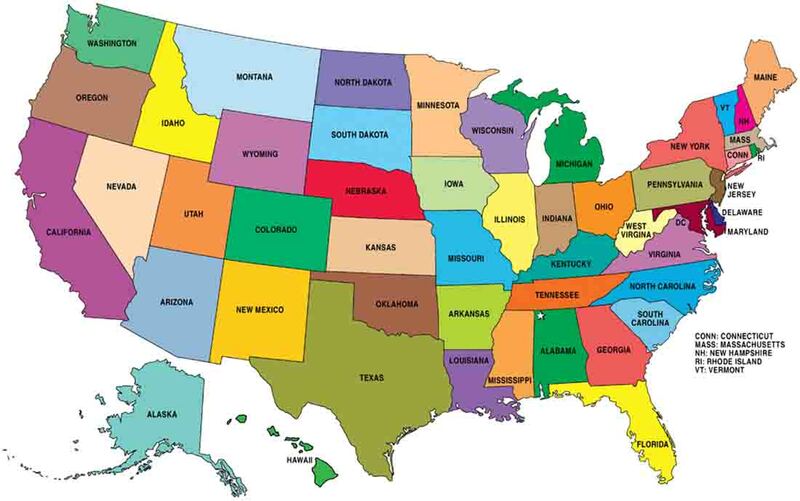 All these 50 states, when taken together, “unitedly” act as a single country called the U.S.A. So you get my point? Just by decoding a simple abbreviation and questioning each word reveals so much more information that simply escapes many minds. The information wasn’t hidden or anything, its just that no one ever looked that way. In DSLR, the letter ‘D’ stands for digital. It is because the final format in which the image is recorded is digital and NOT photographic film. The predecessor of DSLR cameras were called SLRs, Single Lens Reflex. They functioned exactly the same way as the DSLRs do now except that they used films to record images and not digital sensors and flash memory. This is pretty self-explanatory. The camera uses one and only one lens for taking photographs as well as to show an accurate representation of the image before the image is recorded. In other words, only one lens is used for both the optical viewfinder and the digital image sensor to capture an image. To put this into context, cameras before the SLRs had always had more than one lens. From traditional Rangefinders to the TLRs, all had a pair of lenses. One for taking images and focus the light on to the film and the other to be used to create an accurate representation of the forthcoming image on the viewfinder. “TLR”, by the way, stands for Twin Lens Reflex. It has the mechanics of the camera etched in the name itself. Due to these basic and fundamental changes, many things in the various camera types are also different. 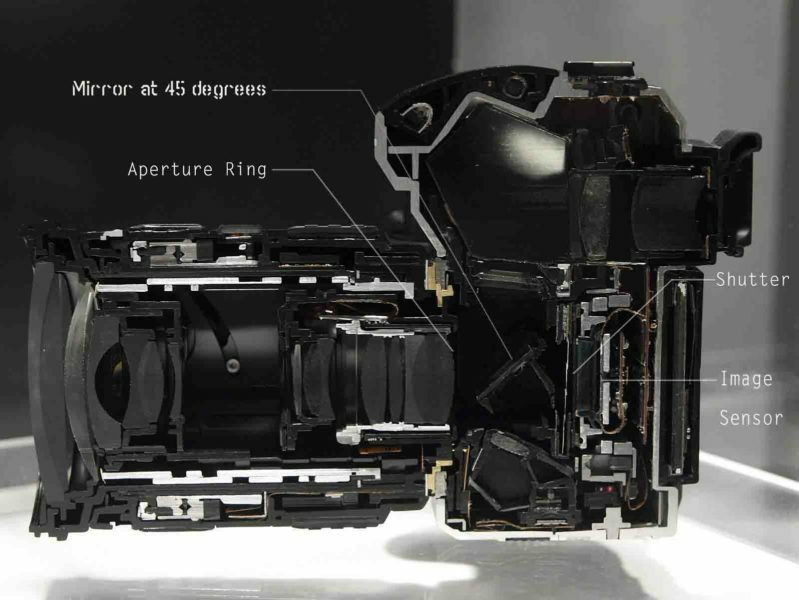 The Auto-focusing, light metering, etc function in different ways in all these cameras mentioned above. Since DSLRs have just one lens to play with, they needed to find a way to use the light entering through the lens for both the viewfinder and the imaging sensor. The solution that they came up with was to place a mirror in front of the digital sensor at 45 degrees and directing the light up towards a pentaprism and out of the optical viewfinder (OVF). This would act as the default position of the internal camera mechanics. The photographer can look through the viewfinder anytime and have an excellent representation of the image that would be taken if he pressed the shutter button then. The image in the viewfinder is never laterally inverted (like in Twin Lens Systems). Nor is it flipped upside down (like in pinhole cameras). It is straight up; what you see is what you get. When the photographer actually wants to take an image, he can just press the shutter button which would then flip the mirror up and open up the shutter behind it to expose the sensor further behind it to the incoming light. Just as soon as the image is taken, the shutter closes back up and the mirror is reset to its prior position. Read that last paragraph once again. I insist! It is precisely due to this reason that you have a momentary “blackout” on your optical viewfinder when the image is being recorded. Since the mirror is flipped up to direct the light towards the sensor, no light reaches the viewfinder for this brief sliver of time. It is however very noticeable when using extremely long shutter speeds or when you take many images on burst/continuous mode. Ever wondered about the momentary blackout before? Now you know the reason! If you think carefully now, the Twin Lens Reflex Camera (TLR) also has a “reflex” in it. That is because it too uses a similar mechanism to reflect the incoming light towards the viewfinder above it. It just uses a separate independent lens to do it, unlike the DSLR which uses a single lens. I hope you got a little more than what you came in looking for. The history of camera and their evolution is indeed very interesting. Give it a shot if you can; I am sure you will like it a lot. From the early pinhole cameras to our current line up of cutting-edge mirrorless madness, it is quite a journey. The perfect amalgamation of science and art that is photography, it has had its fair share of ups and downs. The book 500 Cameras tells the tale beautifully. Let me know how you like it. And like always, keep shooting amazing!